Sand & Sky Porefining Face Mask is a pink clay face mask that helps to detoxify and brighten skin in only 10 minutes. The Australian botanical infused, super-powered four-in-one formula tightens pores, invigorates a dull complexion and instantly boosts radiance. Includes free applicator brush. I'm always sceptical whenever I see skincare products get super hyped up on social media. But one day I decided to give this a go and wow! The difference in my skin is massive since I started using this. You only need the smallest, thinnest layer across the entire face and it packs a huge punch. My acne has reduced dramatically, my pores are smaller and my fine lines are diminished dramatically. I swear by this stuff now and I refuse to be without it! If you have sensitive skin, only use once a week! I tried Sand and Sky products recently and was then tempted to buy the mask, it is such a great natural product. It comes in a jar with a brush that makes it easy to use and apply. The brush is such a great idea. I have been using it for a few weeks now and after applying it and leaving it for a few minutes I wash it off. It so easy to get off unlike some masks. My skin feels to clean and fresh I have also noticed that once the dirt is lifted my skin in glowing. It feels soft and does not feel stripped of its natural oils. I think the product is a bit expensive but its totally worth the money. I have used several different types of clay masks but none of them were as expensive as this one! Having heard a lot about it I was really curious about trying it out. I have oily and acne prone skin and clay masks are great as they absorb excess oil while removing impurities which will hopefully balance out my skin and help make it look clearer. The pore refining mask comes in a pink tub and it comes with a brush as well to apply the mask. I thought that the brush was a great idea as it keeps your hands clean, is hygienic and means that you can make the most of your product without creating any wastage. It made applying the mask a breeze! The ingredients in the product are clay, aloe vera, Kakadu plum, liquorice root extract, vitamin A, witch hazel and vitamin E.
Once I applied the clay all over my face I waited for around 10 minutes until the clay had dried up before I washed it off. After several minutes I could feel my face tightening because of the clay and once it dried I washed it all off with warm water. Removing the clay mask wasn't too difficult compared to other clay masks. I would use it at least 2-3 times a week and I found that it helped get rid of any excess oil from my face while also balancing out my skin. The unfortunate part was that I didn't see any noticeable difference with my large pores, congestion and black heads. On my nose I could see that it had brought some of the impurities to the surface but didn't actually remove them. Even though it had brightening ingredients I found that my skin looked the same and there was no difference in the texture of my skin. For me the clay mask worked mostly for getting rid of oil and keeping it matte. It is cruelty free and free of nasties which is great but I would say that it's an average clay mask, good but not great and definitely not worth the expensive price. I have used clay masks that are much cheaper and still do a good job. It was nice to try once but I would not repurchase. For years I have been fighting acne that is caused from allergies, dehydration, large pores and stress. Ever since middle school I have accepted that my skin would never look as perfect as the more fortunate women around me. I started using face masks from the grocery store and Walgreens and it either did nothing or made my skin worse. I can say that after 24 years, I Have finally found the magic cure. This mask worked instantly for a glow and pore cleanse but also cleared up my acne in 2 weeks! MY pores are SO small! I am pretty sure this is one of the only products I will ever use for my skin in my life. Also, my husband is obsessed with this mask as well. It cleared up all of his acne as well! We now celebrate Face Mask Friday's :) Smells amazing too! A little goes a long way especially with the brush. I learned the hard way when I would glob the mask onto my face each time and ran out quickly. You don't need a ton for it to work. Since the mask is expensive (but totally worth it trust me) do yourself a favor and save some cash by either not sharing the mask or applying generously. ANY SKIN TYPE. PEOPLE WHO HAVE STRUGGLED WITH ACNE AND BLACKHEADS THEIR ENTIRE LIFE. THE CURE FOR GREAT SKIN! You know that thing that blinds you when looking down from the Space Station? My face human, my face! Glowing! This little pot of goodness is smushed in the opaque pink glass pot. You get tiny winy brush to apply the stuff. It is good. Makes mask application more fun and easy. Left mask on until dry. After washing and pat drying skin is so smooth and soft. My skin is mid age, huge pores, combo, prone to dehydration but not dryness. The regular use of this mask just gives me that radiant skin and healthy glow. Maintaining it mostly. And using to recover skin when needed. I was lucky enough to have enough points to be able to redeem this product through the beautorium store. I suffer from cystic acne, and have since a teenager (currently 27) as a side effect of my PCOS. This product has done my skin wonders, and brings radiance to my dull, acne-scar covered skin. The mask was easy to apply with the good quality brush provided. The mask seemed to cling to my pores and literally draw out impurities as it dried (hallelujah - for the cystic acne that usually takes weeks to surface). After the mask had dried, I washed it off with warm water and my hands, and was pleasantly surprised how easy it came off. I can't get enough of this product! Just after few applications, I can significantly see the difference in my pores. My pores are smaller and my face always feels so fresh and glowing after use. I usually have sensitive skin so I was very cautious with trying this product but I knew that I just had to try it. Whilst it is a bit on the expensive side for a face mask, I find that it is worth every dollar! Love it! Try it if you have large pores. My daughter recommended this product to me but I wasn't keen to try it because I thought it was a bit pricey. She kept raving about it and gave me hers to try. Well I can definitely say I am a convert! A small brush is included in the box which makes sure the clay goes on evenly and without too much wastage. When you apply it to your face you experience a tingly feeling as it has a bit of a sting to it at first. As it dries your face feels mildly uncomfortable as it shrinks and cracks and you may notice a slight 'earthy' aroma that is not unpleasant. After 10 minutes or so splash the bulk of it off with warm water and then finish off with a face cloth. I immediately noticed my skin feeling softer and after a few applications noticed my pores looking smaller. I think it has reduced the redness of some of the scars as well. I started off using it every other day but have since cut back to every three or four days. It IS quite expensive but if you keep an eye on the website you can pick up a bargain. My daughter and I got a 'Friends Deal' - 2 for about $110 recently which was a considerable saving - around $15 each. Apply after you have cleansed your face with warm water to open the pores of your skin and tone after you remove it to ensure there is no residue left behind. Just about anyone with some sort of problem skin - redness, blackheads, enlarged pores and acne. At $70 a jar for what is essentially pink clay, this product is pretty steep in terms of cost. I found that it felt nice on the skin and did an ok job, but for this product I want it to really make a difference! After using most of the jar, I still have blackheads and break outs, and I can't really see what difference it has made. Probably the most disappointing factor for me, was that the last 1/4 of the jar dried up and I couldn't use it. It hadn't been open for an excessive amount of time and had been stored appropriately so that was really disappointing. I really didn't want to buy this product. I absolutely HATE giving in to the hype on Instagram and Facebook when products like this pop up again and again. They're normally average products that are overpriced for no reason. Not this one! This mask is quite expensive, but for good reason. I've used it about 5 times, and it's totally transformed my skin. I have less texture, my pores are less visible, and my skin looks radiant. I used the product as recommended for a few weeks and saw no difference. I was so hopefully when i purchased but for the price and quantity, i was left disappointed. I enjoyed the brush, it made the product easy to apply. The consistency was smooth and it was gentle on my skin but it didn't deliver on any of the promises and left me feeling disappointed in my investment. The Sand & Sky Porefining Face Mask is one I have seen a lot of social media lately. The pink clay mask aesthetic has attracted a lot of attention, and I for one was also keen to try such a pretty looking product. 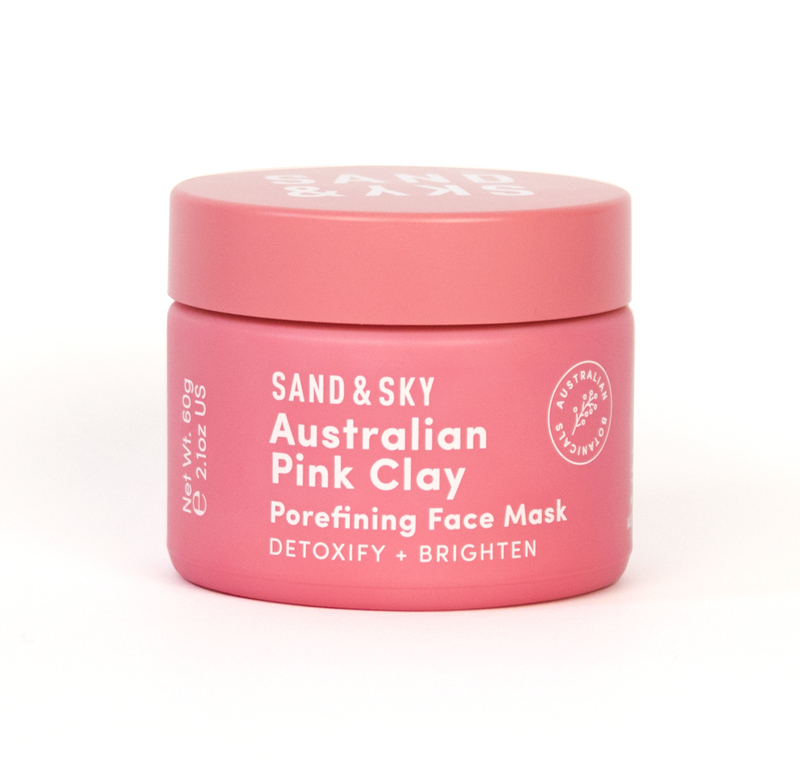 The Sand & Sky Porefining Face Mask comes in a cute glass pink jar with a screw top lid and it has 60 g of product. An added bonus is that the mask comes with a Sand & Sky brush to apply the mask to your face. To use you apply the mask using the brush and leave on for about 10 minutes. Then you wash the mask off with warm water. For dry or sensitive skin it is recommended to use the mask for 1-2 times a week, whilst for oily skin 2-3 times a week. My skin is normal to dry. The mask has a light flowery scent and a greyish-pink colour. Application is made quick, easy and hygienic with the brush. It has a thick consistency so you only need a small amount of product to cover your whole face. It feels cooling once applied to the face and the clay mask dries and hardens to your face within 10 minutes. I preferred to apply this mask before having a shower, as it was just quicker and easier for me to wash it off that way. I have used this mask a handful of times since receiving it, and I have found this clay mask to be particularly helpful with reducing the redness and hormonal acne I have recently been suffering from. When I wash off the mask my skin feels extremely clean and soft. However, my skin does also feel a little bit tight so I use a good moisturizer afterwards. I like how the mask makes my skin feel a lot softer, clearer, reduces the redness and acne and helps refine my pores. I am glad this face mask lived up to the hype, as it is a bit more expensive than some other masks on the market, so very happy that it has great results. I would recommend this face mask to others. Great for using before having a shower. I was fortunate enough to receive this product as part of the Discovery Bag. This product is easy to apply using the brush supplied. It drys quickly & feels nice Applied after cleaning and left for 10 min. The clay is light pink then changes to white once dry. Easily removed. My face was left soft, smooth and glowing. Pores near my nose area are slightly less noticeable, maybe due to the rest of my face looking refreshed. Instantly boosted my full skin. Highly recommend. Cleanse first. Apply using the brush supplied & a little does go a long way. A definite skin pick me up. Detoxes & perfect for those wishing to tighten pores. Relaxing clay mask for a fresher feeling face. Thank you to BH for accepting me onto the Discovery Bag Trail for this month, as part of this month’s pack I got the Sand & Sky Porefining Face Mask. The mask comes in a soft feel cardboard box. The bottom half and the back panel is coral pink in colour whilst the top half has a blue / green picture of a reef seen from above. Most of the text, apart from the barcode is in white. Something which I often laugh at when I get products which are pricy enough that they seal the top of the box, they did not seal the base… therefore you can easily open the base of the box to get to the tub. The box advises me that this product is botanically infused and works to be an instant detox which tightens pores, invigorate a dull complexion and instantly boost radiance. When you open the box you get a mini pamphlet which gives you instructions for use which is more detailed that what is on the box and a bit more background information. You also will find the mini application brush with the pamphlet which comes with a slip cover. The brush has the words Sand & Sky printed in white on the handle and has really soft smooth bristles that helps me apply a thin layer of the Mask to my face so that a little goes a long way. The brush is easy to clean and dries overnight. Under the brush is another cardboard flap which has a cartoon sun rising / setting over water which you can lift with a finger to get to the main product. The clay mask comes in a heavy quality glass jar with a plastic screw top lid, both are in the same coral pink colour as the box and all text is in white ink/paint. The jar contains 60g of product. When you lift the lid, the inside of the jar is white and there is a white plastic cover over the product which you need to lift before you can get to the clay which is tightly closed over the product. The clay mask itself is a light grey-pink colour and the product looks glossy in the jar. The scent is light and botanical. The clay is of a thick mud consistency and with the help of the brush you can apply a thin layer which comes up as a semi translucent dirty pink colour which dries and hardens to a light pink colour after about 10 minutes. After use, it is best to use a wet cloth to help you remove all product from your face. After use I have found that the facemask helps to dry out pimples deep under my skin (the instructions advised that this can also be used as a spot treatment) and in the morning after a few times of use I have found that though my pores are not yet ‘porefined’ the skin on my face feels fresher and brighter. This product looks and feels like a quality product, it is made in Australia and I have really enjoyed using it. Note: This product does come with a caution for people who are already using Vitamin A as it also contains Vitamin A.
I received this product in the August discovery bag and am happy to continue to use it. I haven’t used masks in years and did struggle to find time to apply this as I have young children and didn’t want to give them a fright so I’d have to wait till they went to bed. This product comes in a glass jar and is heavy for the size which makes sense as lay is the main ingredient and carrier for all the other ingredients. It has all sorts of goodies in it like Aloe Veraand Kakadu Plum as well as Vitamin A. They also provide a small (approximately 10cm) brush to apply the mask which comes in the box. The bristles are nice and soft and I have not had any shedding. To me, the main thing I smell is clay, which again makes sense. It starts to dry pretty quickly and I feel a tightening sensation almost immediately. It’s more intense around my nostril area almost stinging but not unbearable at all. While I’m waiting for it to dry I rinse out my brush and do a few other things. Which I assume is a plus over sheet masks. Rinsing off was easy and there was no stubborn bits that refused to come off. As soon as I rinsed the mask off I noticed my pores were significantly smaller. Even after applying my make up my pores are noticeably smaller. I used it on some emerging pimples and it worked really well, clearing them up a lot faster. It did seem to make my skin a little dryer than usual so I just added an oil into my skin care routine to counteract it. Overall I’m impressed with this mask and would probably purchase if it wasn’t so expensive. It probably will last a long time which makes the the cost per use affordable but the initial outlay is a bit high for me. Use on pimples for a quick and effective remedy. May require an extra step before moisturising. for a product that visibly reduces pore size. I had heard this was hyped up on social media and was quite sceptical of the hype. But it's actually amazing! From the very first use I could see my skin was brighter and clearer. My blackheads were gone and my skin felt and looked smooth and soft. There is no heavy scent, just the regular clay smell. The brush is great quality and makes application so easy and mess free. I just swipe this all over and leave for 10 minutes. By that time most of the mask has dried up. I use a face cloth to wipe it all off and it washes off really well. Some clay masks tend to cling to the skin or get into my hairline but this washes off cleanly and easily. My face is so clean afterwards. It does feel tight though, I must say. I immediately run to add a lot of hydrating back in. But it does feel great to have a deep clean out twice a week. The jar is quite weighty and nice. The plastic stopper is great to prevent the mask from drying out but it is wedged in quite tightly so it can take some effort to remove. This is quite a pricey mask but the results are on par with Glamglow and they are even more pricey, so I think this is actually a cheaper alternative! I will highly recommend this. WOW! My complexion - every time after applying this luxurious Australian made face mask. This product really delivers. The packaging and instructions are just gorgeous and have a quality feel to them - don't drop the glass jar! The smooth clay-type mask is cooling to the skin and is easily applied with the small brush provided. There's an earthy botanical scent to the product. I experienced a little tingling within the first few minutes. My 40+ normal slightly combo skin was visibly brightened and pores - especially my t-zone - much smaller after every use. I noticed a difference in how well my evening serums absorbed afterwards. The 60g tub is enough for 8 -12 masks depending on how generous you apply it. I'm keen to try the exfoliating scrub by this brand as well now. I'll be treating myself to this experience at least once per week. Make sure the inner cap is sealed between uses. This product comes in a glass jar with a brush applicator. The brush is quite sturdy and its bristles are very soft. It also comes with an instruction card, which contains some tips. The product has a creamy consistency. Application is extremely easy with the brush provided and it truly feels like a spa experience applying this mask with the brush. The one thing I disliked when applying this mask was its scent. I has a bit of a chemical smell. However, while the mask is drying the scent disappears. The instructions state to leave it on for 10 minutes. Within those 10 minutes the mask significantly tightened while drying and my face was stiff. After 10 minutes I rinsed with warm water. It was very easy to rinse of the mask with water. I am extremely happy with the visible results after using this mask. My pores were noticeably smaller, it removed almost all my blackheads and whiteheads and my face felt so soft. Overall, a big win for me and this mask is something that I will purchase.